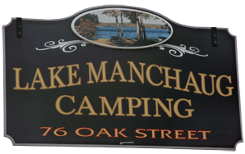 Lake Manchaug Camping boasts beautiful waterfront cabin rentals in Massachusetts, as well as campsites for a tranquil, secluded setting. Regardless of which style of vacation rental you prefer, a fun and relaxing time are sure to be had by all. Rentals are considered to be "Good Housekeeping," they are clean when you are checked-in, and we ask that they are that way when you vacate after your lakefront vacation. The $300 security deposit authorization is released if the rental is clean and undamaged. This model features one bedroom, one living room with a queen sofa bed, and a full kitchen and bath. Campers also receive basic cable service and Wi-Fi. The cabin model features one bedroom, one bathroom, living room with queen sofa bed, full kitchen, and a screened-in deck. Campers also receive basic cable service and Wi-Fi perfect for your camping trip. For more information about our properties or rates, please contact us in Douglas, Massachusetts.